Seniors! Please read each section of this page carefully so that you know what you will need to do to prepare for the Baccalaureate Mass and Graduation. Congratulations to the parents and seniors of the class of 2019! a. Please be on time; the sooner we start, the sooner we finish. b. Seniors must attend the entire practice from beginning to end to participate in graduation activities. c. Caps and gowns will be distributed at the end of practice at NDP. d. Please dress in appropriate length shorts or jeans, and shirts with sleeves (NDP shirt or college shirt). No short shorts, no short dresses, no yoga pants or leggings of any type, no cleavage, no tank tops, and no spaghetti straps. Remember, you will be in Church on Wednesday. This is a mandatory event for all graduating seniors. Graduates must arrive no later than 4:30 p.m. and will be directed to a meeting hall. Doors will open for guest seating at 4:30 p.m. Graduates must bring their Graduation gown (no cap), which will be worn during Mass. Please be aware that there is limited seating at the church. All graduates will wear gowns without caps for Baccalaureate Mass and caps and gowns for the commencement exercises. No items may be worn on the outside of the gown or on the cap (ie. Pins, writing, jewelry, etc.). The only exception to this rule will be National Honor Society medals/Honors Thespian Sashes, Tri-M and National Dance Society Honor Cords, Valedictorian/Salutatorian/Honors medals, and Kairos medals/leader crosses. No gum or food of any kind may be brought into Bemis Field. Anything in your possession, including but not limited to cell phone, purses, bags, or keys, etc. will be held for you until the conclusion of the ceremony. You can pick up your items from a specified location afterwards. 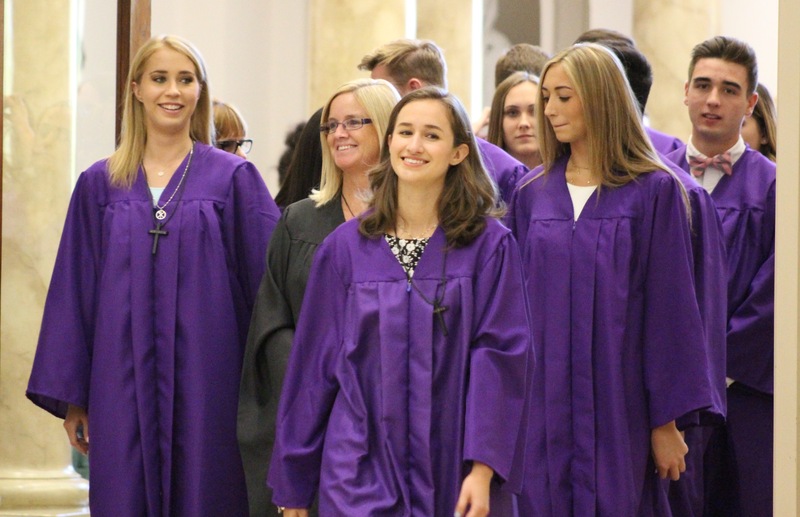 Baccalaureate Mass and commencement exercises are events shared by Catholic college preparatory schools around the world. They honor and celebrate the extraordinary accomplishments of the graduating class. Proper decorum honors these traditions and the individuals who have worked so tirelessly to provide them. It is expected that all graduates honor each ceremony through their attentive participation. Inappropriate behavior may result in students not receiving their diploma. Graduates must arrive no later than 5:15 p.m. Graduates must check-in at the Chapel and should be dropped off as no cars can remain at NDP after the graduation ceremony concludes. Graduates will take their graduation photos prior to the start of the ceremony. 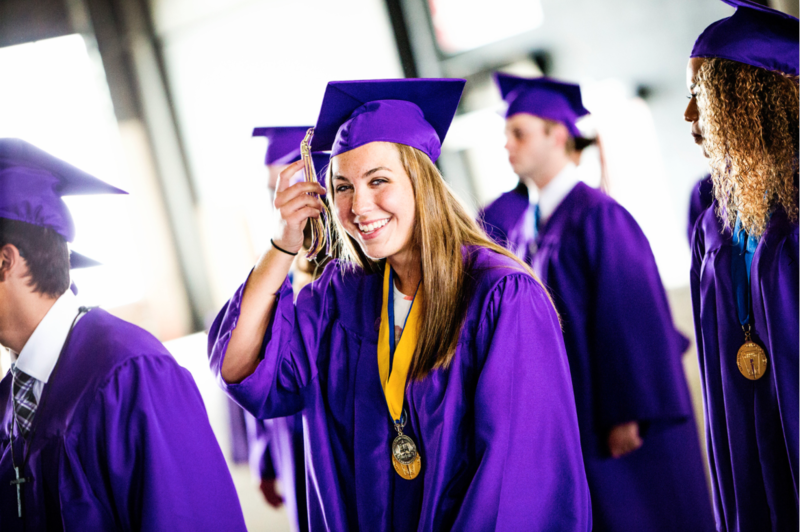 Graduates must bring their cap and gown to be worn during the ceremony. Gates to Bemis Field will open at 5:30p.m. Families will not need a ticket to attend graduation for general admission seating. Please note we have 50 less graduates from last year and do not anticipate all seats to be filled. Handicap seating is on the track behind the graduate seating. Visibility may be limited. Please know that any type of umbrella will not be allowed at graduation due to visibility. Notre Dame will open up the cafeteria to view a live stream of graduation. Doors to the gym will open at 5:30pm. You can view graduation starting at 6:45pm on May 17th by clicking on the link here. Should you have someone in your group who needs handicap seating, please call or email Renee Hiskey by Monday, May 6, rhiskey@ndpsaints.org / 480.634.8244. Your entire group will be able to sit in the handicap section. NDP parking lots will become available after 3:30 on the 17th. There will be approximately 40 handicap parking spots available in the senior parking lot. Please note handicap parking is based on availability. For those who will utilize Uber/Lyft/taxi, drop off and pick up will be in front of the entrance to the senior parking lot. We will have security and staff volunteers directing traffic. Our goal is to get guests in and out of campus as smoothly as possible. The guidance parking lot will not be available for graduation parking, this will be used for faculty and staff. a. Rehearsals – April 17 at 1:15 p.m. and May 3 at 8:00 a.m.
and May 4 at 3:00 p.m.
b. Fashion Show Event – May 4, 8:00 p.m.
For more information, contact Renee Hiskey at (480)634-8244. Let the 2019 Yearbook staff take the stress out of the Memory Lane poster. 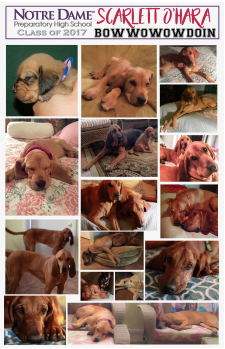 Choose photos that represent special times with family and friends. Include pets. This is something your senior can bring to college and take comfort in the memories. Send between 6-16 (max) photos digitally to Rebecca Strolic at rstrolic@ndpsaints.org. These photos must be submitted by Friday, April 17, 2019, as either JPEGs, PNGs, or PDFs. Include in the email your senior’s name and the name of the college your senior will be attending, as well as any specific requests for the placement of the photos. One of the YB staffers will be assigned get to work on the design. You should receive a proof for editing within five schooldays. We will have a limited amount of blank Memory Lane posters available at the front desk if it is necessary for you to design the poster yourself. And finally laminate the poster before turning it in to the front desk by April 28, 2019. This is a tradition at Notre Dame Preparatory that began with the first graduating Class of 2005 to help celebrate this momentous occasion. 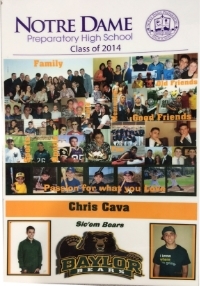 We would like all of our seniors to have a Memory Lane Poster, so please help spread the word to other senior parents. If you have any questions, please email Rebecca Strolic at rstrolic@ndpsaints.org.